[XPB-5402] Dual Roll Toilet Tissue Dispenser is constructed of Stainless Steel with a satin finish. Toilet paper dispenser is designed for surface mounting onto any wall. Wall mounted toilet paper dispenser is vandal resistant and equipped with polyethylene spindles for a non-controlled delivery. 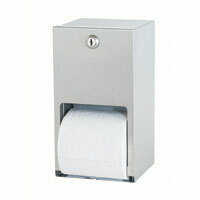 Dispenser is secured with a tubler lock and holds two standard rolls up to 4-3/4" diameter. Specifications and details are available upon request. For shipping quotes, orders or questions please call our Customer Service Center at 1-877-483-9270.